I'm going to start trying to post shorter, more daily-life type updates here from now on. It may diverge from my original goal of sticking strictly to studying Japanese, but I will mix in tidbits about that, as well as my observations about Japanese culture throughout my posts. Maybe in the future I'll be writing these in Japanese, that's certainly the goal :) I was told that Japanese college was a lot easier than American colleges... maybe that only applies to undergrads? All I know is the school has really piled on the work. It was nice to take a break today and play some futsal. Playing futsal energizes me enough to continue slogging through the pile of work I have remaining until the end of the semester. I've joined two great futsal circles (unofficial school clubs), and been playing weekly. It has been a great way to both meet new friends and stay in shape at the same time. Speaking of staying in shape, no one could tell me where to find free weights in Japan. The school's gym only allows access to them between 5pm and 7pm on weekdays, and that just isn't accessible enough for me. Unfortunately knew where to find any, so I ended up ordering from Amazon.co.jp. Tomorrow is a national holiday, so I won't have my normal class. Instead I'll be writing a program that can use a device you strap to your body to measure how fast you are moving parts of your body (such as your arm) so that you can calculate how much energy you are using while lifting weights. It should be able to tell you in real-time how many calories you are burning... I haven't decided if I'll provide other units for people to measure in, such as cheeseburgers. I don't actually know if the Japanese have cheeseburgers here... maybe I'll enquire about that to one of my futsal friends. I'm still not sure exactly what I'll be doing over the mid-winter break. My friend Austin might be coming from Seattle for a visit. I've known him since first grade. He's one of my two best friends, and I'm sure it would be a lot of fun if he came. My other best friend is named Derek, is half-Japanese, and dislikes almost everything to do with Asian cultures. It's funny how things work out like that. His mom is Japanese, but she doesn't speak any of the Japanese language, and her mom can barely remember any. 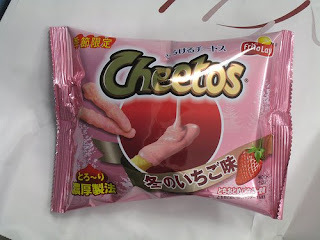 In closing, I think I'll add the picture I took of the Strawberry Cheetos I found in the school's Seikyo (campus store). To date, that's probably the weirdest food I've seen here. I've got a question about the Cheeto's. Are the plain or cheesy cheeto's that are covered in strawberry youghurt? Anyway... I figured that might help. I'll be looking forward to your next post.